Saach Pass | high road to.. In todays Tribune : Saach Pas , the third route or at least starting point for Leh , from Chamba in Himachal Pradesh , opens today. Including ” tourist traffic and pedestrians”. Stiff hike up to 4413 meters. This weekend meant snow at last , in Kinnaur , Lahaul and Manali, maxing out in Keylong : sixteen centimeters of snow. In lower regions it came down as rain , feeding both irrigation and the the starving hydel power plants that have been been down to fifty per cent of normal capacity after the long dry winter. 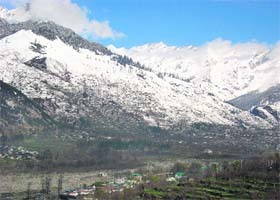 Kalpa in Kinnaur was coldest at -2.5 degrees , and had less snow : snow is a warm weather phenomenom. 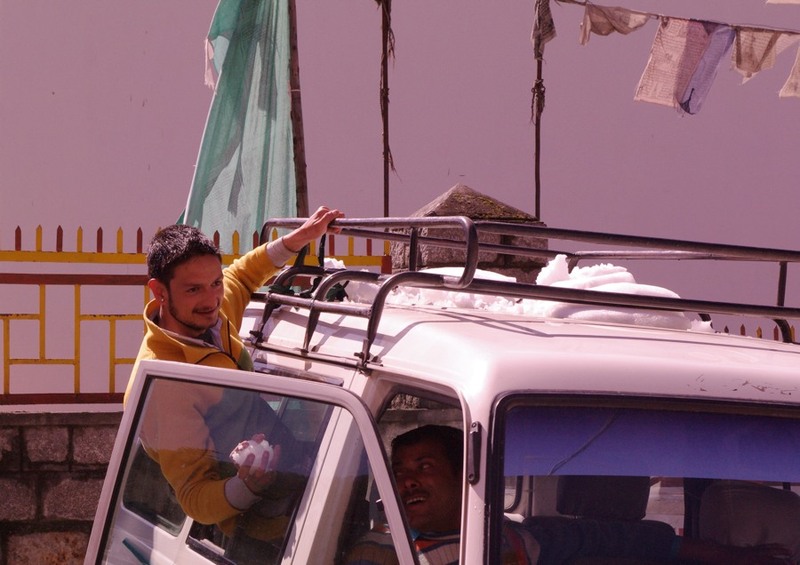 The Manali-Leh road was closed for lighter vehicles from Kothi , at the 2500 meter level , with snow falling all the way up to the Rothang pass the BRO had to call it a day early in the afternoon. Chamba region also reported heavy (no numbers given ) snowfall , probably affecting the clearing of Saach Pass. UPDATE 25/3 : Two more feet of snow around the Rothang and Marhi , work to resume when the weather gets better. 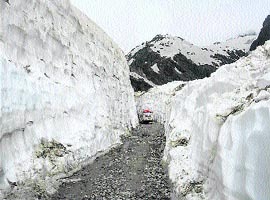 Road open to Gulaba (with eight inches of fresh snow, BRO crew just short of the Rothang. Swedish trekker henko went over the pass last year in July (photo below) , and mentions snow stiil being cleared from the road. Haven´t been able to pin down the actual opening date. The harsh weather at Saach Pass caused many to retreat to lower elevations , but a group coming from Pangi judged that conditions were manageable , and continued. Sadly they were proven wrong , and all four perished in an avalanche. The highest road from Chamba to Killar crossing over the Saach Pass situated at an altitude of 4413 metres linking the Pangi tribal valley with Chamba was reopened for vehicular traffic on Friday, Jagdev Singh Pathania, resident commissioner of Pangi, told The Tribune over the phone.